You are here: Home / CELEBRATIONS / Delicious Mini Cheesecakes – Easy to Customize! 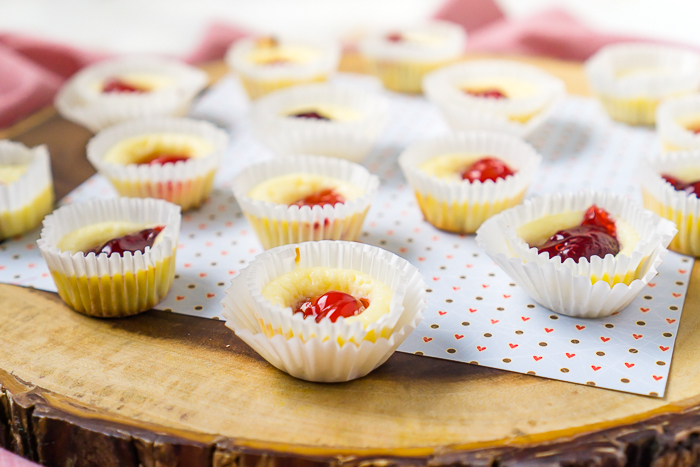 Mini Cheesecakes with Vanilla Wafers for a crust is a crowd favorite dessert recipe! All the creamy goodness of cheesecake in tiny bite form that are easy to serve and easy to enjoy. You seriously need to give this mini cheesecake recipe a try at your next celebration! EASILY CUSTOMIZED MINI CHEESECAKES BITES! I am very vocal about the fact that I am a not a cake fan. Growing up, my mom would always make me one of three birthday desserts: cheesecake, apple pie or lemon meringue pie. Cheesecake was always my favorite but definitely required a bit more work for my mom. She was a perfectionist baker, and cheesecake would often prevent a challenge for her. NOT these easy mini cheesecakes though or my cheesecake dips, but you’re all here about the cheesecake bites! 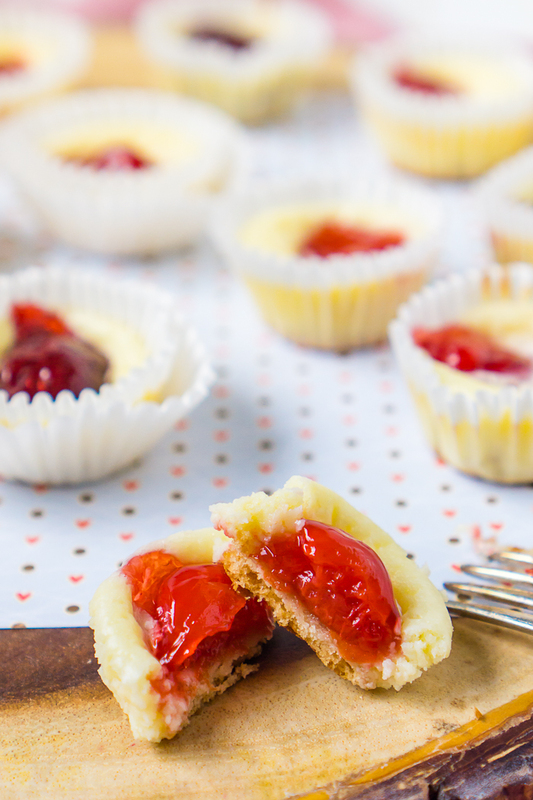 These Mini Cheesecakes I am sharing here today are made with vanilla wafers for a crust, a simple, easy cheesecake filling in the middle, and either strawberries or cherries on top! A large batch can be whipped together quickly with just around 15 minutes of prep work. It’s honestly a perfect party dessert, especially for the holidays – easy to make, easy to transport, easy to serve and easy to clean up! The best think about these mini cheesecake bites though is how they can be easily customized, which I will get into more below! So keep reading if you want lots of ideas for customizing mini cheesecake for any season, holiday or personal preferences. , too, which is great if you are having guests over. You can easily switch up the fruit topping – cherry, strawberry, apple, or even homemade berry jam are all an option. I used the berry jam for my Berry Oreo Mini Cheesecakes, and they turned out amazing! When making cheesecake bites, you will first need to choose your cheesecake crust. I prefer using a simple crust solution and will therefore often use a cookie as a base. I just find it trickier than necessary to use graham cracker crumbs to make the cheesecake crust in a mini cupcake liner. For this recipe, I used a mini Nilla Wafer which fits perfectly in the bottom of mini cupcakes liners. If you are wanting to make slightly larger mini cheesecakes and use a regular size muffin pan instead, original sized Nilla Wafers fit into the standard cupcake liners. I will be sharing more crust ideas below! After you have made a decision about your mini cheesecake crust, your first step will be to prep your pan and cupcake liners with desired crust! For this recipe it means adding a mini cupcake liner to each cup with a mini Nilla Wafer at the bottom. Second, mix together your filling ingredients until smooth. Third, add about 1 1/2 teaspoons of filling for a mini muffin pan on top of your crust. For a regular sized muffin pan, you will add about 2 tablespoons of filling. Then, spoon one cherry or strawberry on the top of the filling. Bake your cheesecake bites at 350 degrees for 12-15 minutes. The basic cheesecake filling recipe I use starts with cream cheese, egg, sugar, and lemon juice. From there, you have the ability to doctor your filling if you wish or leave it plain and make customizations with the crust or topping. If you are looking for ways to customize the filling, you can consider adding cookie crumbs to the filling like I did with my Mini Oreo Cheesecakes or you can do an equal substitution of the lemon juice for a different extract instead, which I’ve done for Peppermint Cheesecakes. You could also play around with cake mixes for adding flavor to the cheesecake filling, like my Mini Funfetti Cheesecakes. When I use cake mix, I add 1/4 cup of desired cake mix and a few tablespoons of sour cream. The sour cream helps counter the dry cake mix being added to keep the cheesecake soft and moist. 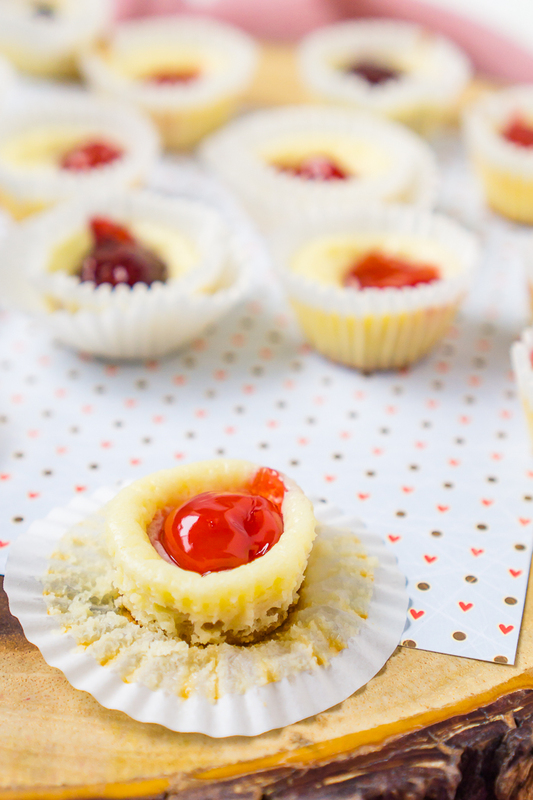 The easiest way to change up the flavor of the mini cheesecakes is to change crust. A basic graham cracker crust consists 1 1/4 cups graham cracker crumbs, 3 tablespoons of brown sugar and 5 tablespoons of melted butter. Then press into bottom of the liners to create a compact crust. You can use this basic crust recipe with almost any other crumb to create something different, such as gingersnap crust, pretzel crust, or even a nut crust. Or you can use a full cookie like I prefer doing as long as it can fit into your cupcake liner, such as Oreos, Nilla Wafers, grasshopper cookies, chocolate chip cookies, and more! Adding new and different toppings to a basic cheesecake is another easy way to switch up the flavors for whatever season or holiday you are baking for. The sky is the limit with jams, pie fillings, curds, cookie crumbles or more. My favorite topping right now is on my Pecan Pie Cheesecakes, which use the basic cheesecake filling and Nilla wafer crust as shown here. My prettiest cheesecake topping though is on my Mixed Berry Oreo Cheesecakes that I love making for New Years; the shades of pink really make them stand out! HELPFUL ITEMS FOR MAKING CHEESECAKE BITES! YOU MIGHT ALSO ENJOY THESE OTHER DESSERT BITES! It’s Time to Enjoy These Mini Cheesecake Bites with Vanilla Wafers!!! Addicting Cheesecake Bites!! Delicious recipe for Mini Cheesecakes with vanilla wafer crust, creamy cheesecake filling, your favorite fruit topping! Prepare mini cupcake pan with small cupcake liners and place a Nilla Wafer at the bottom of each cupcake liner. Beat cream cheese until smooth and a little fluffy in texture. Add sugar, egg, and lemon juice to the cream cheese and beat until smooth. Scoop around 1 1/2 teaspoons of cheesecake filling onto each vanilla wafer then add one cherry or strawberry on top of the filling. Bake at 350 degrees F for 10-15 minutes.